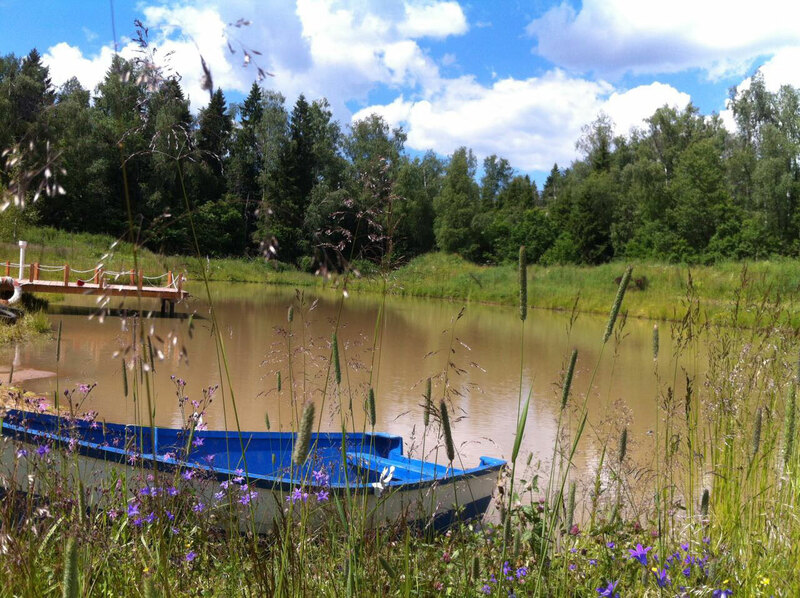 Several years ago, we dug a permaculture style pond. 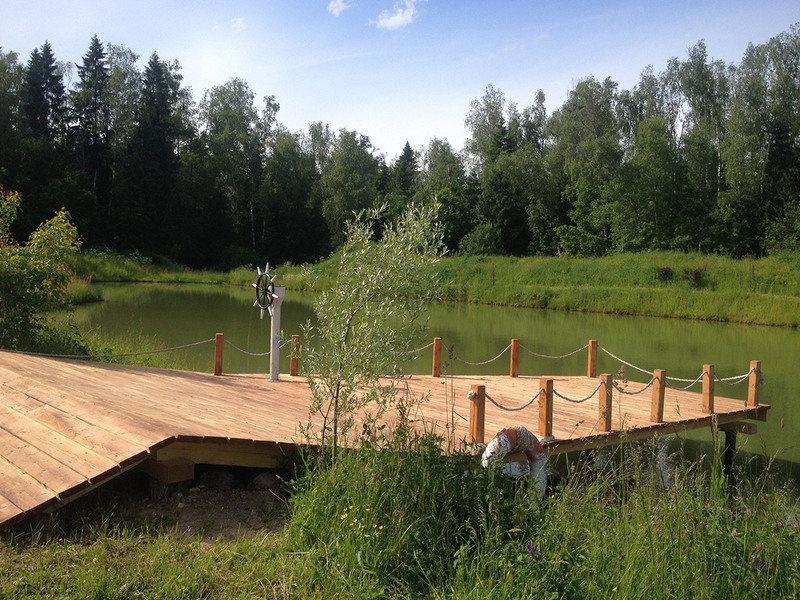 Now it can be used by our guests to swim, fish, and sail. Welcome to our lovely family farm and child friendly campsite! Our territory is ideal for children's camps and creative activities. The Museum-Reserve "Mouranovo" is a unique sample of middle-class noble manor of the XIX century. 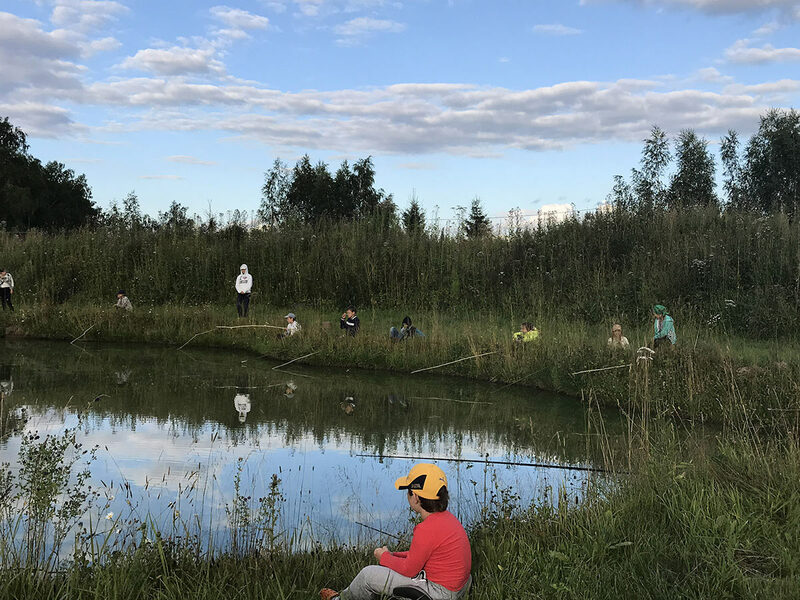 Our family farm & campsite is located some 50 km away from Moscow in one of the most picturesque areas of the Moscow region. 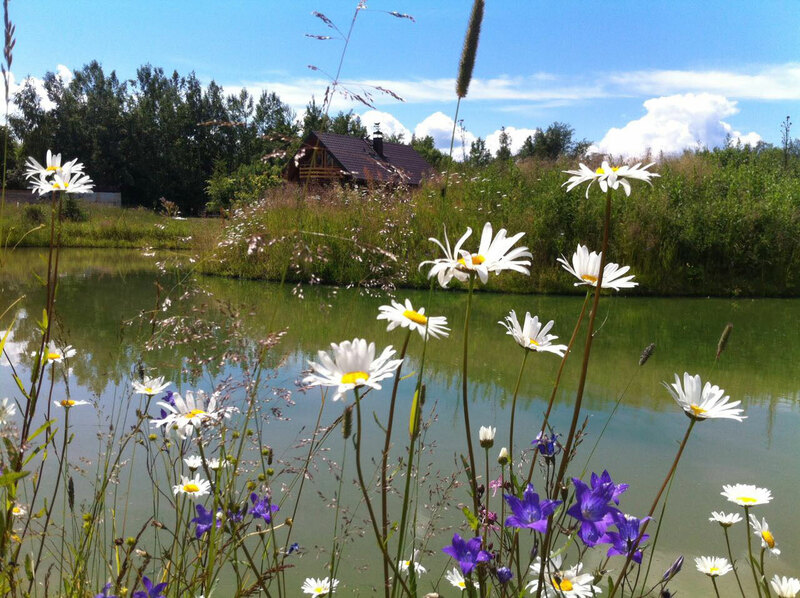 The farm nestles on a beautifully designed area of 5 hectares. Trying to run our farm in a nature friendly fashion, we use no chemical fertilisers. 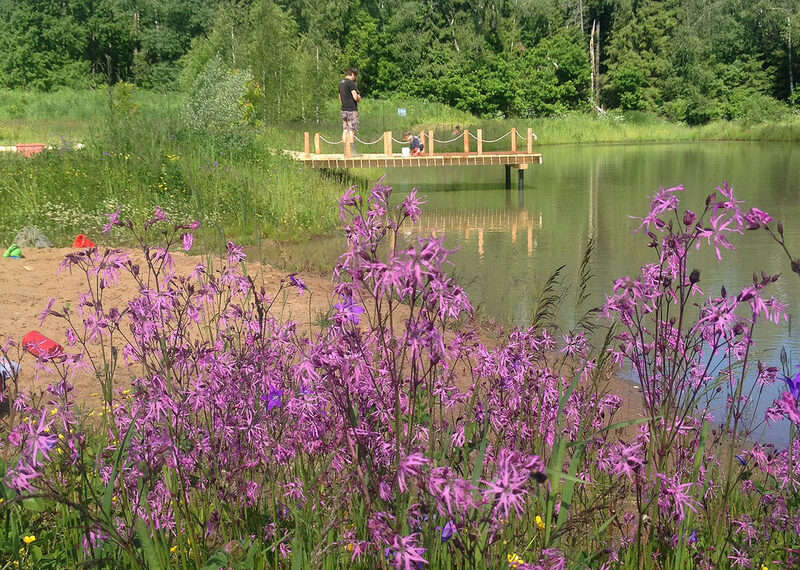 Our pond is home for several fish species. 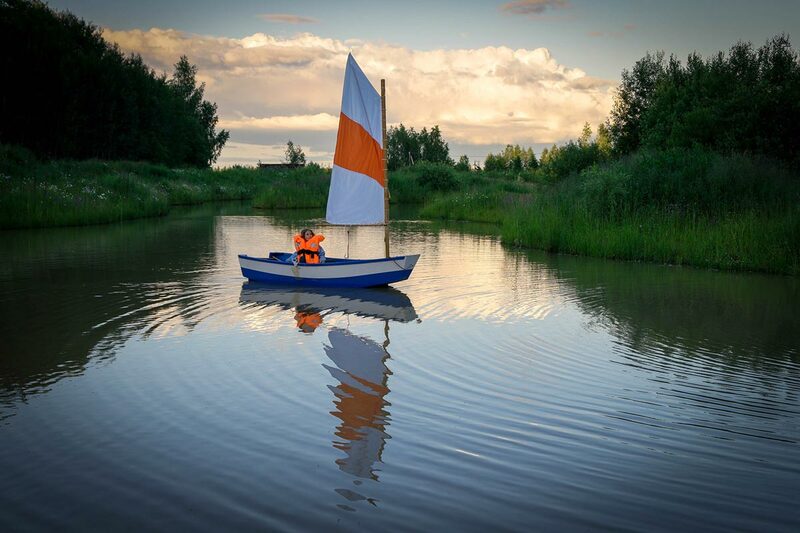 Our guests are encouraged to fish, swim, sail. 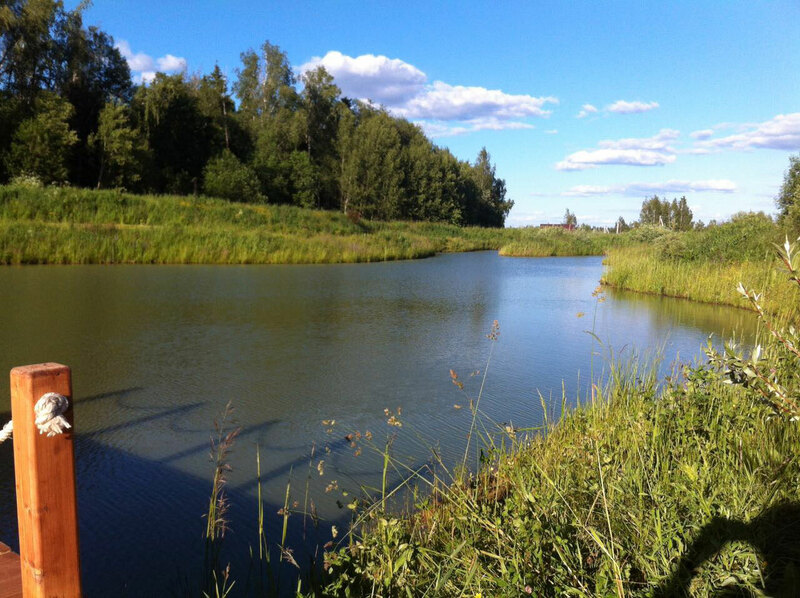 The water in the pond is good for health as it contains valuable clay particles that make the water look yellowish. Water analysis showed it’s drinkable. So our pond is very pleasant to swim and dive. 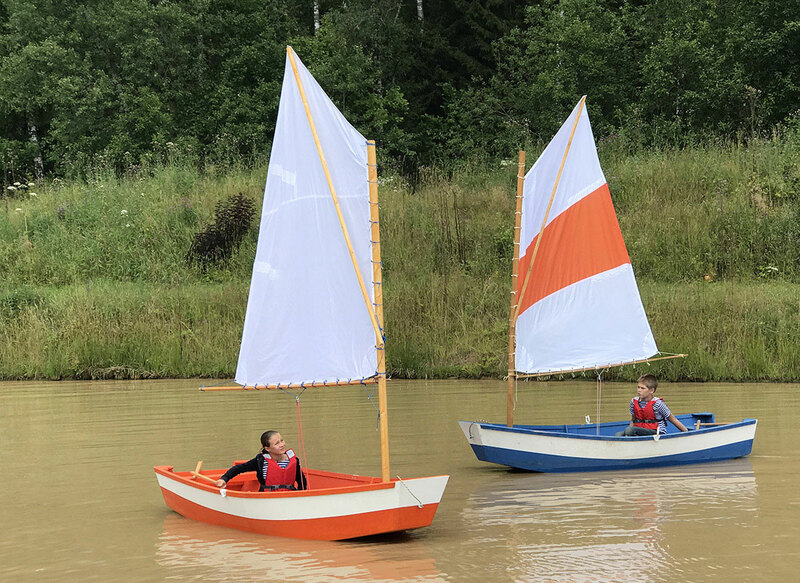 We often arrange weekend children’s activities or weekly children’s camps. 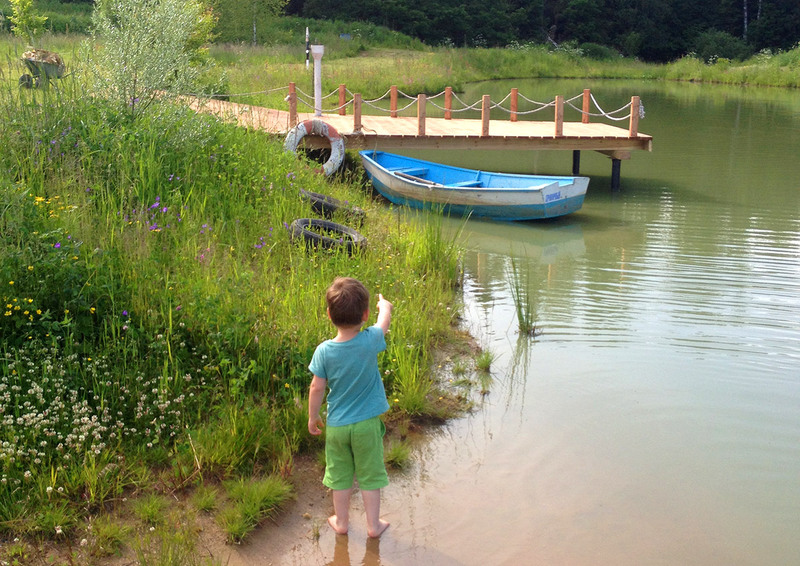 Our large sea camp “Port of the Five Seas” is very popular among children. The Teodor Tyutchev State Museum “Muranovo” is both a unique memorial of Russian culture of the 19th and the early 20th century and a perfect example of outstanding museum work of the 1920-30s. In the past Muranovo was an average country estate which consisted of the main house, a church, different residential and household buildings, a garden and a park. The estate and the surrounding landscape make up an inseparable harmony. The most important place of interest in the estate is the main house which was built in 1842 by Yevgeny Boratynsky. Today it is a complex of literary and everyday life memorials of two great Russian poets, Yevgeny Boratynsky and Feodor Tyutchev. In the main house are also kept the archives of I.S. Aksakov (a poet and Tyutchev’s first biographer), N.V. Putyata (a literary critic and a friend of Boratynsky) and L.N. Engelgardt (the author of historical memoirs). The history of Muranovo as a “literary estate” lasted for a century. In 1816 this small estate in vicinity of Moscow was purchased by E.P. Engelgardt, the wife of a resigned general L.N. Engelgardt. Having took part in different wars he became well-known as the author of memoirs of the reign of Catherine II, Paul I and Alexander I. In 1826 the poet Y.A. Boratynsky married the elder daughter of Engelgardt, Anastasia, and in 1837 his friend N.V. Putyata married the younger one, Sophia. In the first time Boratynsky visited Muranovo in 1826. Since 1828 he spent in almost every summer in Muranovo with his family. In the poem “There is a beautiful land, there is a place on Earth” written in the early 1830s Boratynsky described the landscape of Muranovo with all of its unique features. Since 1841 Boratynsky was busy with various problems of house management. In 1842 he was arranging the construction of a lumber mill, the collecting, selling and seeding of wood. He also drew a blueprint of a new two-storey house. In 1842 a book of his philosophical poems, “The Twilight”, was published. In autumn of 1843 he set off on a journey abroad that turned to be his last journey. On June 29,1844 Boratynsky suddenly died in Naples. In 1850 Boratynsky’s property was shared between his wife and her sister. As a result the estate passed into the hands of the Putyata family. The Putyata carefully stored Boratynsky’s heritage: the portraits, the bureau, and different items connected with his literary works and his last journey. Muranovo still remained “the poet’s land”. In 1859 N.V. Putyata published “The Memoirs” of his father-in-law L.N. Engelgardt and in 1867 he published Boratynsky’s letters with detailed comments. Putyata’s relationships in the Russian literary world defined the circle of his guests in Muranovo. Among them were N.V. Gogol, S.I Aksakov, K.S. Aksakov, prince V.F. Odoevsky, princess E.P. Rostopchina, S.A. Sobolevsky, S.D. Poltoratsky and others. In 1869 Putyata’s daughter Olga married Teodor Tyutchev’s son Ivan. They continued collection, storage and publication cultural valuables that could be found in Muranovo. A family legend says that Feodor Tyutchev once visited his son in Muranovo, but only after the poet’s death the estate became a depository of his heritage. From time to time Tyutchev’s autographs, portraits books and personal belongings were brought there from Moscow, St. Petersburg and Ovstug, the poet’s country estate in the Orel province. In 1879 I.T. Tyutchev built a wing in the main house for his mother Ernestina, who by that time became a widow. There she was preparing the publication of her husband’s works. I.S. Aksakov who was the husband of Tyutchev’s elder daughter Anne, also repeatedly visited Muranovo. In 1874 he published the first biography of Tyutchev. His work included both family legends and documented evidence kept in the estate. 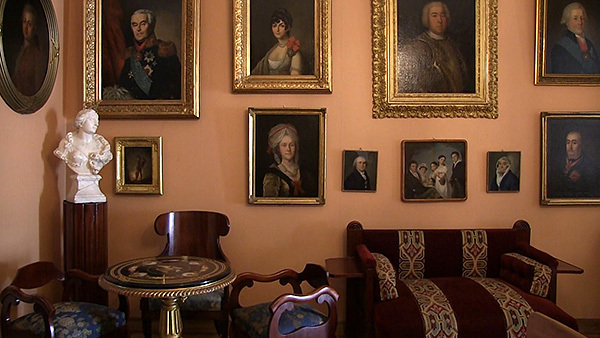 After Aksakov’s death his widow donated to Muranovo a part of her husband’s autographs, books and portraits and the setting of his Moscow cabinet. To Muranovo also passed the heritage of N.V. Sushkov who married Tyutchev’s sister Daria. In the 1850s he published Tyutchev’s poems in his almanac “The rout”. In Sushkov’s house in Moscow lived Catherine, the poet’s daughter who was also involved in Russian literary life. Her sister D.F. Tyutcheva and her brother Ivan published the second, more complete collection of their father’s works. After the death of both sisters a lot of portraits, documents and books from their estate Varvarino were brought to Muranovo. So Ivan and Olga Tyutchev became the keepers of the heritage of Boratynsky , Tyutchev, and their contemporaries and relatives. Muranovo is a rare example of an unravaged family estate where cultural traditions were kept for such a long period of time.